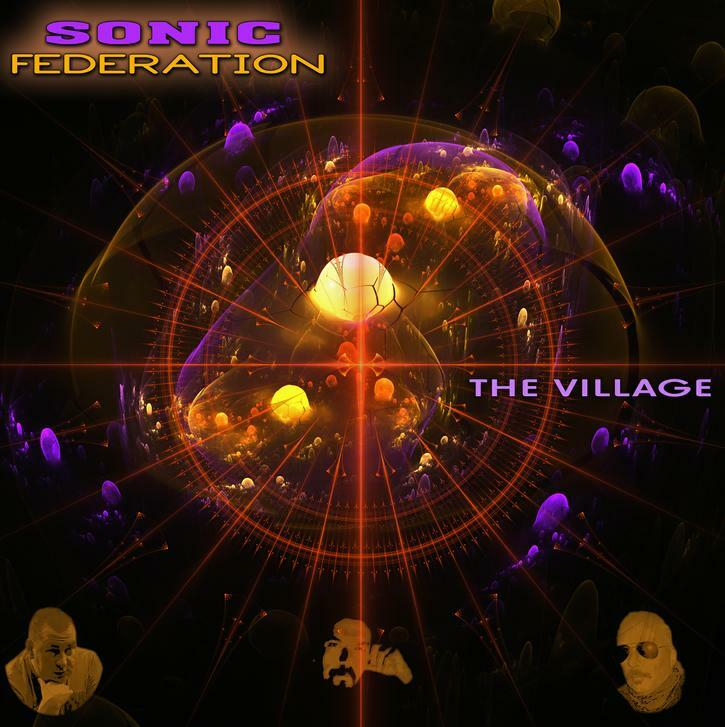 Sonic Federation is the trio of Mike Hobson (UK), who records as Thought Experiment, on guitars and bass, Bert Hulshoff (Netherlands), who records as Phrozenlight, on various synths and keyboards, and Mac of BIOnight (Italy) on vocals and VST emulations of drums, piano, organ and mellotron. We certainly note The Prisoner theme with some of the track titles. Arrival At The Village opens with a few minutes of flowing synth soundscapes. Then a little bass riff signals Mac to start singing: “They took my freedom. They took my life and my friends. They tried to force me to say I was happy again”. After a couple verses the bass and drums kick in and we’re Space-Prog rocking for a while before transitioning to an eerie cosmic dreamland. Village Life consists of rhythmic jazzy grooving Space Rock with vocals, a tasty tinkling keyboard melody, a cool rolling bass melody, Psych-Jazz guitar licks, and myriad spaced out samples and effects. The 21 minute Escape From The Village is the stretched out epic monster of the set. After a few minutes of disorienting and somewhat dissonant fluttering guitar patterns and ambience the trio launch into an energetic rocking Space-Prog segment with Mac singing of the escape and a great combination of driving rhythm section, jazzy space keys, soaring soundscapes and a banquet of effects. But nothing stays the same for long as the music highlights various points of the escape route. The music morphs through drifting ambience led by winding guitar licks to a killer classic Berlin school sequenced section accentuated with foreboding atmospherics and later joined by a swirling church organ. The mood becomes increasingly intense, taking on a space-orchestral cinematic quality and a mind blurring array of instrumental and effects components, before winding down to a mystifying guitar, synths, soundscapes, organ and effects conclusion that brings to mind the Phantom of the Opera sitting in with early Tangerine Dream. Absolutely fantastic! Hooked Up To Electronics follows, beginning with a spaced out guitar and effects intro. Then a bass riff and half sung, half narrative vocals kick in while the guitar and effects continue to teasingly trip along. This track is all about dark and ominous thematic development, being dominated by killer cosmic guitar effects, all manner of soundscapes and atmospherics, and includes some of the most impassioned vocals I’ve ever heard from Mac. The mood is both darkly creepy and deep space cosmic, though optimism reigns at the end as we conclude on a peacefully angelic note. Finally, End Game lays down a steadily jaunty rocking groove with Psychedelic looped or backward guitar licks. After a while the rhythm recedes and we find ourselves floating in space, surrounded by haunting organ and effects whizzing by, before launching into an acoustic guitar driven and happily bouncy vocal segment that leaves at least some hope for the future: “We can evolve into what we could have been since the beginning, free from chains, free from greed… free…”. Overall an excellent set of Prog infused Space Rock and cosmic electronica.